My name is Janez Stariha, born and raised in the capital of green Slovenia, Ljubljana. 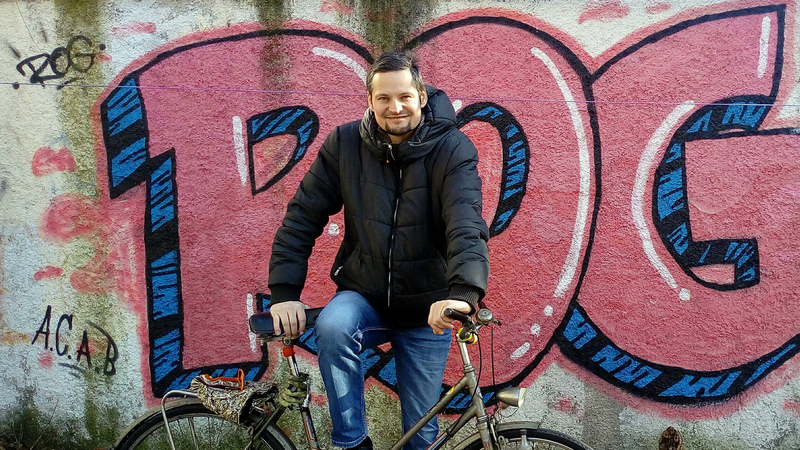 I am a cyclist, member of Party of cyclists and pedestrians of Slovenia, member of Ljubljana City Council and founder of Ljubljana BikeKitchen. I live a sustainable lifestyle, cycling and walking whenever possible, growing my own produce and teaching others how to do so. My mission is to make Ljubljana safer for cyclists, especially for the younger generations, to increase the number of daily commuters who cycle to work and to reverse bicycle theft in my city. I don`t see many obstacles in achieving my goals. The main challenge would be to change commuters` mindset to see the ecological, and social benefits of riding their bikes in everyday commutes. My first step would be to connect the City of Ljubljana, the Mayor and Ljubljana bicycle network in a working group, which will focus on the Bicycle Mayor mission. What can other cities learn from your city? Ljubljana is a green city, where littering is not acceptable. One of the best things people can take away from Ljubljana is this attitude to taking pride in keeping public spaces clean, green and free of litter.